So. I almost pulled an amb and went on about an actor (!) in a new-found TV favorite. Sci fi fans have known about Eureka for ages as it went off-air only a few years ago. But I just recently stumbled upon it and have gone head-over-in-heels crazy in love with the show. A bit Dr. Who, it’s based more on reality (read: no aliens) and is full of suspense, romance, laughs, great special effects, twisty-turny jaw-dropping storylines, and beautiful people. In what seems a strange–albeit extremely profitable–move, Mr. Ferguson was chosen as the latest (and decidedly hottest) Maytag repairman. He’s actually quite entertaining in these commercials (watch them here–seriously, do) and I’m thrilled to have finally found a food connection for Mr. Ferguson. (Maytag=refrigerators=food. Yes?) This means I do not have to scrap all that I’ve written and hunt down that increasingly elusive funny name in food. My work here is done–phew! Enjoy Mr. Ferguson and I’m off to start hunting down next month’s name. This entry was posted in funny names in food, funny names in tv and tagged actors, Colin Ferguson, deLizious, Eureka, hot guys, science fiction. Bookmark the permalink. I love Eureka! It got cancelled? Hmmm. Is it on Netflicks? 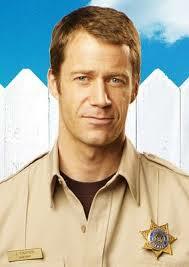 And yes, Colin Ferguson is a heart throb. Hey, Rio. Found Eureka on Netflix, yes. Cancelled after five seasons a few years back. Am almost through and enjoying. Appreciate your visit! Aha! Diddy’s theory of Funny Name scarcity gaining a little more traction, is it? Hmm? Let’s set the record straight, Liz. I slavishly copied BoFN at my place using Kyary. But I came to BoFN because you and Amb dragged me over and forced Dave to let me in. A tall drink of water? Do you gals really say that? Stretching it Liz. Stretching it. Well, I think Colin Ferguson represents the first stage of funny name depletion: the kinda-sorta maybe a little funny name. On the other hand, you range over the topics so nimbly here, who’s going to notice? ‘k now, Diddy. You’ve given me a lot to deal with here. I think we should call a meeting to discuss. Working backward: Tough call on the names that work here. Eureka also has a Niall Matter, but he did not excite me as much as did Mr. F. Just call me Jack-be-nimble and thanks for what I think (?) was a compliment. BoFN is all about pushing boundaries, so I am pushing the kitchen appliance confines. And the Kipling went way over my head. Sorry to be so dense, but what did that have to do with the price of tea in China? Or funny names? Funny names are everywhere, as your Dr Seuss poem so brilliantly pointed out, but just because a person has a good name doesn’t mean he or she is worth writing about. I got really excited about this Colin guy, so he had to work. His first name IS just one letter away from an internal organ and a punctuation mark. I think Funny Names in Food can be a very versatile category… I think that if you can provide proof that someone eats food (or has eaten food at some point in their life), they should qualify for this category. Also, any funny named food items can qualify as well… particularly ones that have names: Eggs Benedict, Veal Oscar. Or just awesome terms like pumpernickel bialy! (I’m not even sure if that’s a thing, but Supermarket sweep used to talk about pumpernickel bagels and bialys). Oh, speaking of Supermarket Sweep…. how about David Ruprecht? That’s a funny-ish name, and the beady-eyed guy once ran as a Libertarian candidate for political office. Uh oh… I’ve fallen into a recursive loop of funny names brainstorming! Make it stop! The good thing is I’m teaching an MCAT class in 18 minutes. Time to get rolling! yes to versatile–appreciate the support, King D. I see lots of funny names in food, but I only want to write about people I’m excited about. Hadn’t realized I could delve into the world of actual food names. Opens up a whole ‘nother door. Hope your class went well. Cracking up that you teach MCAT classes and I teach boozy marshmallow classes. I’m supposed to be the more mature one, due to my age and all. Sheesh. Well now I’m done with my MCAT class and a 2-hour tutoring session, so I can now spend my evening preparing for boozy trivia time! Woohoo! That one’s worth the price of admission, Liz. Kipling’s bleak poem is about reality, the gods of the Copybook Headings, kicking in against idealistic delusions. I was trying to stretch the allusion to cover Funny Name scarcity, hitting the recurring theme/running battle of the Blossom Dearie post, the Grinch post, and the Mary Cheeves Perky post, and now your post which continues to explore that eternal question! The idealists say there is an endless supply of funny names. The grim gods of the Copybook Headings say no. I got your back, Liz! Isn’t that a rousing protest chant? But I like optimism, too. ?? Durnitt! Which side are you on here, Liz! my side, of course. Though I’ll stand with you that there really aren’t enough (interesting) funny names to go around. Well, you know how to inspire an interesting comment thread, I’ll say that! I was wondering about “a tall drink of water” and “hubba hubba.” I recently posted about people not actually saying “hubba hubba” on my Facebook page, and here is Liz doing it (but it’s writing, so I think my argument still stands… who the heck says hubba hubba in real life when they’re attracted to someone! Diddy…. funny names will never run out. You should see the one Mark emailed to my inbox today. It’s like the British Outerbridge Horsey… so good! In fact, I’ll forward it to you (but I think Mark calls dibs on the name, because it’s so ridiculously good)! Yes, we verily swoon over tall drinks of water. And who knows? Perhaps he says his name like Colin Powell, as in the bowel area, and is that not funny? Hmm? And when he starred in an episode of “Dead Last,” he played Prince Torben of Mulravia. And that is surely hi-larious. thanks for having my back, Kerbey! My husband has a separate room for watching Sci-Fi, as I cannot get into it at all. But during the Eureka years, I confess to peeking in for at least a dozen episodes, for one reason and one reason only. Ferguson. Bravo for not pulling an amb and going on and on about the way he looked in his uniform, fueling certain people’s sheriff-related scenarios–or how he can hold so many dishes at once and get them so clean. Let’s also remember that the former Maytag Repairman was one Gordon Jump (Mr. Carlson on WKRP, the show with the dopest theme song this side of Love Boat), so the step from Gordon to Collin is one giant leap for mankind. BTW, Gordon named his daughter Kiva, so Kiva Jump is begging to one day be famous and be on this blog. I’m a food professional, so had to keep it clean. Though I’d like to see what you and amb might have to say. Hadn’t thought about the Maytag repairman in years, but Ferguson brings charm to the role. I followed your lead and researched my topic here and I learned that he is far more than a pretty face. His improv experience shows in Eureka as he does so much great physical comedy (always moaning and screaming when he gets zapped, etc) and his lines are delivered well as far as timing, etc. Well-traveled, intelligent, versatile actor. Pretty cool guy. So REGARDLESS of diddy’s claim that this name just might not officially qualify as funny, I couldn’t resist writing him up. and lol, he was a game warden in Lake Placid 3. So yes, he wears the uniforms well. And Kiva Jump totally needs to be on this blog! and p.s. “Dopest” is good, right? Yes, and that is a legit question bc sometimes people say that movie is so gnarly and mean good, but sometimes they say that movie is so gnarly and mean bad, so it gets confusing. Hmm, we have some Maytag appliance or another at the house. Gotta be careful not to break it so these handsome fellas don’t come over causing all kinds of hubba-hubba with the ladies of the house. Food connection? Well, you could him Col for short. Col, kind of sounds like kohl, which is cabbage in German! A-ha! Food! Flawless. Hmmm…I think your fridge connector was perhaps less of a stretch after all. You had me at German cabbage. Or did you lose me at German cabbage? I may never know for sure. Though I’d bet she thinks you’re the hubba hubbiest, Arto. This post (and this comment thread!) make me so, so happy on so many levels. Liz !!! I’ve never been prouder of you, my friend. And he’s Canadian !!! *limerence limerence limerence* (Limerence is the new swoon. It’s a thing, now. Once he’s back from the south of France EJ can tell you all about it). ANYWAY, now that I’m done being distracted by those cheekbones, can I just say … oh my goodness, that was fun. Thanks for letting me know what I’ve been missing around here lately, Liz! and the eye crinkles. You saw the eye crinkles? Limerence away. Doubly appropriate if it’s a French thing and Mr. F. speaks French. Needed you here for all of those “many levels,” amb. You’re always the first person I think of when I learn and actor is Canadian. And I totally wrote a “Fave TV Show You’ve Never Heard Of” post, while cloaking it (because I’m stealthy like that) as a FN in Food post. It’s all that spy training from our Argo days. Good to see you here. Don’t be a stranger 😉 And hope your legs haven’t completely fallen off from all the hamster wheel running and underwater paddling. Liz–I can’t believe I missed this post! I love Eureka, so much, in fact, my better half and I purchased all the DVD’s including season 3.5. . . Oh my geek glasses are steaming up. ah ha, well I hope I saw all of 3 with netflix. Thinking I didn’t miss anything. Except for the breakup scene with Tess and Jack which it seems I need to get a DVD for. And were there webisodes I should be looking up, too? Just finished season 5 last night and LOVED how it all tied together. Super high on the show right now–like it’s my most favoritest ever. Easier to relate to than Dr. Who. Though I love the dr, too. I’m so glad you like the show. You’re right the characters change/evolved throughout the series. I thought the writer’s did a great job with it. And the special effects were marvelous for small screen production. It is one of my favorite all time series. I don’t know if they ever did webisodes. I’ll have to spend some time hunting and see if I can find any.